It's Kathy Jo again from I'm a Little Teapot Guest Designing for the "Home of Trendy Twine". 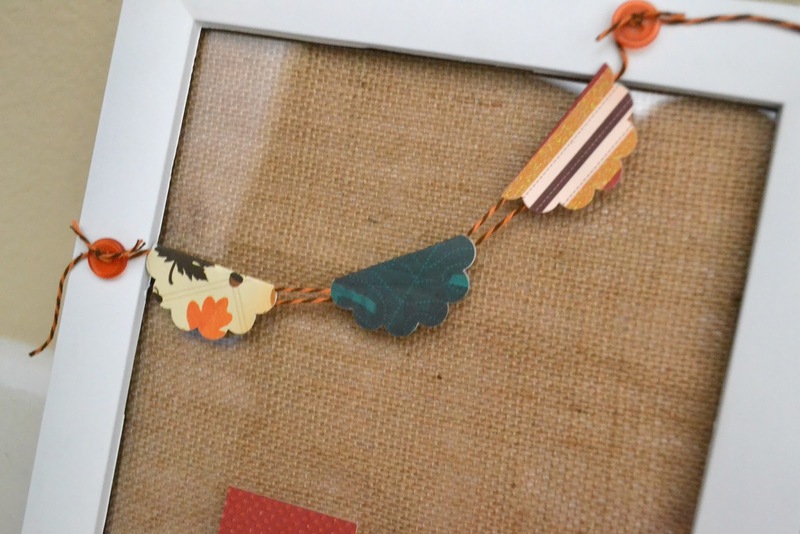 Thanks so much Annie's Paper Boutique for asking me to design projects using Trendy Twine! It has been a fun experience and an honor to be a guest designer! I have a few projects to share today using various Trendy Twine. The first uses the happy Orangesicle twine. Next is a storage method I am using for my twine (and can also serve as an alternate gift bin if you do not want to use a jar). 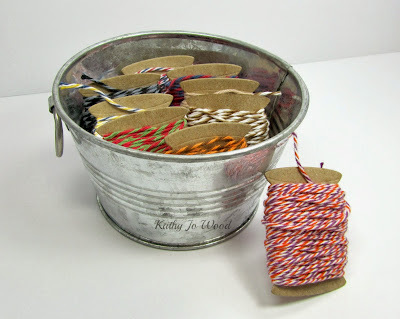 I really like the ease of storing the twine on the die cut bobbins in an open bin. It keeps my twine organized and I can pick out twine easily. It looks great on my desk, too! 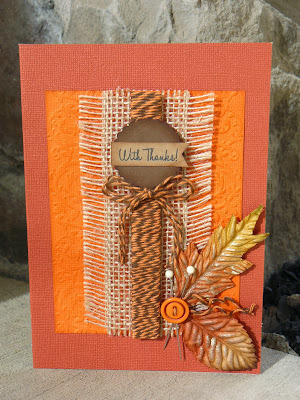 Trendy Twine Totally Kraft was used on the "You Amaze Me" card shown below. The twine was used in four locations: as the bow, on the pink velvet ribbon, looped under my die cut sentiment and woven into the holes on the oval die cut. My last project to share is probably one of the fastest cards I have made. It was a last minute card for a New England Patriots fan and I had no idea how I would incorporate the love for his team onto a card! I looked in my Trendy Twine bin and saw Berries Jubilee...perfect! It was a blast playing in the craft room and making these projects. 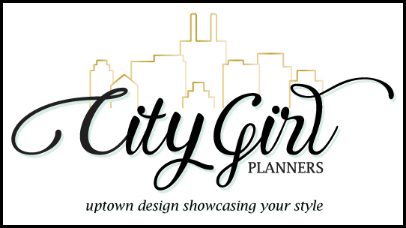 Feel free to stop by my blog tomorrow- I will post a list of each project shown the past two days with all the product used. 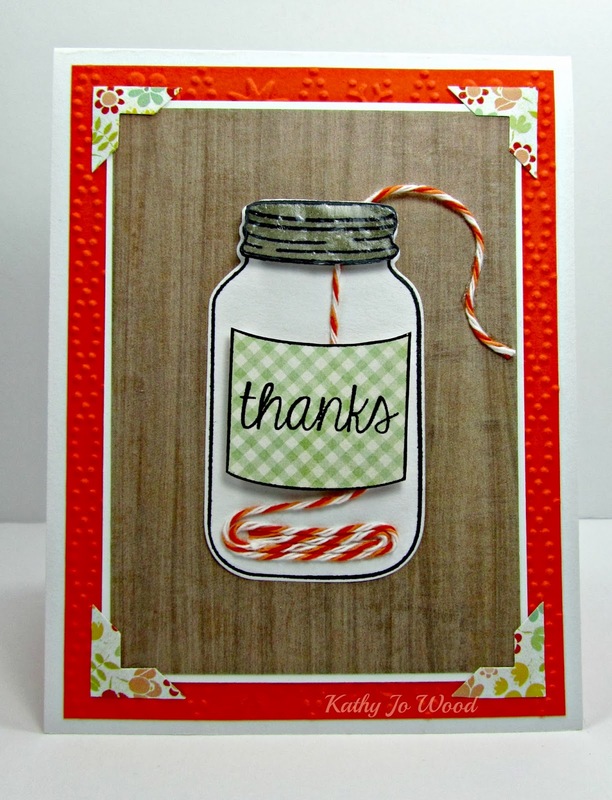 It's Kathy Jo from I'm a Little Teapot and I am honored to be a guest designer today and tomorrow at Trendy Twine! 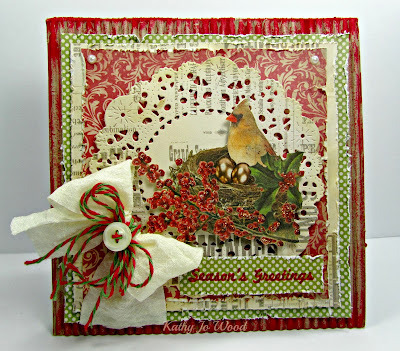 My first twine project used the festive Holly Berry twine...perfect for this year's Christmas cards! I wanted to have the twine emphasized and not lost on my vintage looking papers so I applied a triple-loop twine bow onto an ivory bow. On top of the twine bow is an ivory button with Holly Berry threaded into the button holes. 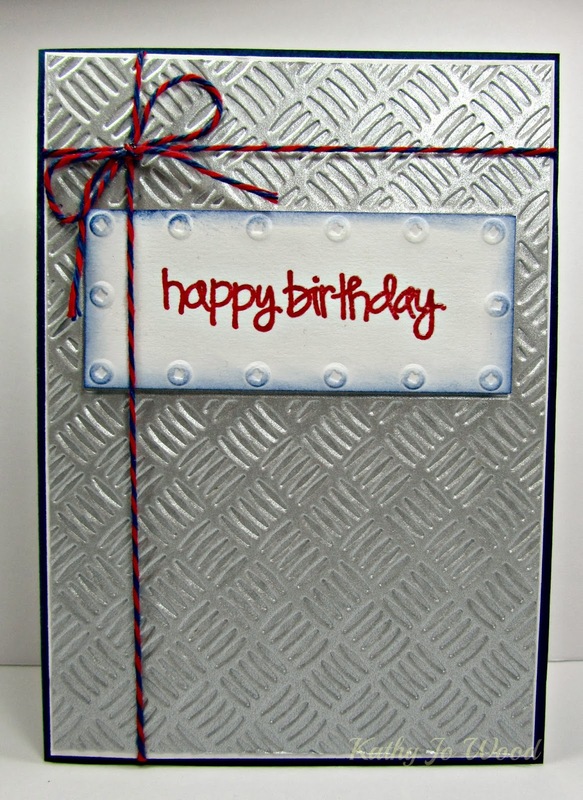 Sticking with the Truffle twines, I used the Chocolate Truffle twine on another card. This twine is too cool- it has a dark brown, light brown and white stripe on the twine. I went festive again with the twine and made a winter themed gatefold card. The front of the card has two mittens tied together using the Chocolate Truffle. 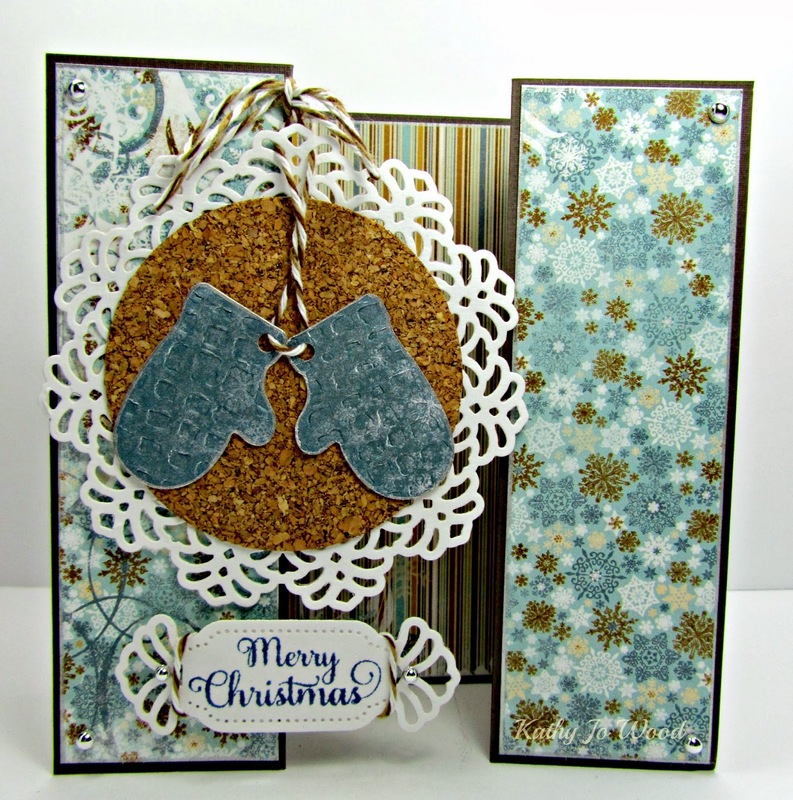 The Merry Christmas die cut tag also has the Chocolate Truffle wrapped around either end. It was fun playing and crafting with Trendy Twine! Tomorrow I will share my last three projects using Trendy Twine. One of the projects may be a sweet gift you can easily make to give to a favorite crafter friend! to help you celebrate this special day. We hope you enjoy your day. 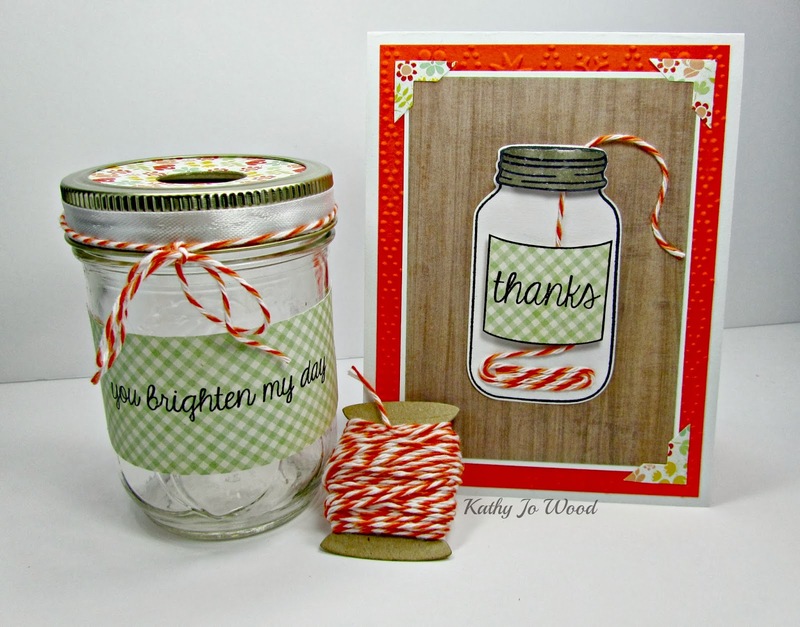 on Trendy Twine and other crafty goodies. Good Morning Everyone, hope everyone had a Great Weekend. 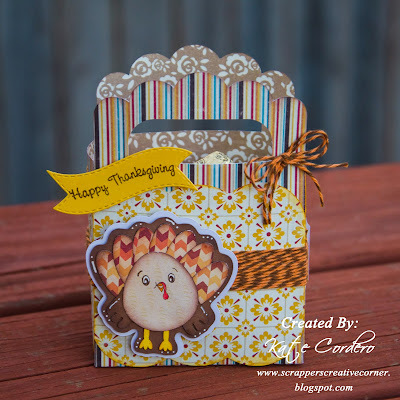 It's Kate here from Kate's Creative Corner and I have a little treat container to share with you today. Are you all excited for Thanksgiving, well at least for the Grub I am. I am cooking my usual Prime Rib, creamed spinach, corn and other yummy stuff. What's on your menu? 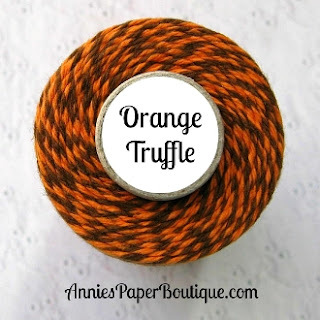 This month we are showcasing the Orange Truffle Twine. But I am also using Chocolate Truffle and Krazy for Kraft. I cut my turkey using a file from SVG Cutting Files. Glued the twin on the feathers and then trimmed it. I inked the sign to make it look more wood and stamp my sentiments using Jaded Blossom. The container and wooden scoops are also from Jaded Blossom. Hope you guys like my project today. For some Trendy Twine just go to their store HERE. Trendy Twines on my project today. As you can see I love mixing up textures and colors on my projects! come together and pop :) The orange card base is Papertrey Ink. The print paper is BoBunny. Pinque Peacock. The Die cut in from Trina Clark and I cut it on my Silhouette. I did a little out lining with black liquid pearls. You can't tell from the photo but there is a wobbler under the turkey. I think my little grand daughters will get a kick out of that!! Thank-you for taking a look at my project! Now for some great Trendy Twine links!!!! 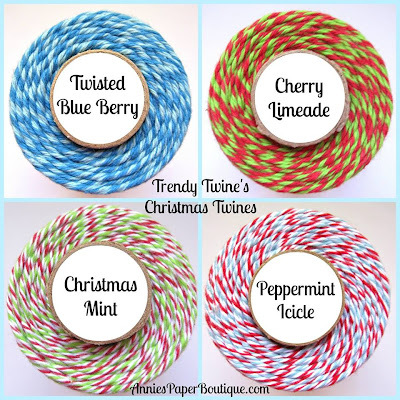 Happy Thursday Twine Lovers! Are all the festive projects getting you ready for Thanksgiving next week? Don't you just love the Orange Truffle twine? I wrapped the twine around the sentiment cardstock three times and topped of with a simple bow. Stop by the Trendy Twine store for the latest sales! We would love to see your Trendy Twine creations! Join our Facebook group - Twine It Up and show off your projects! 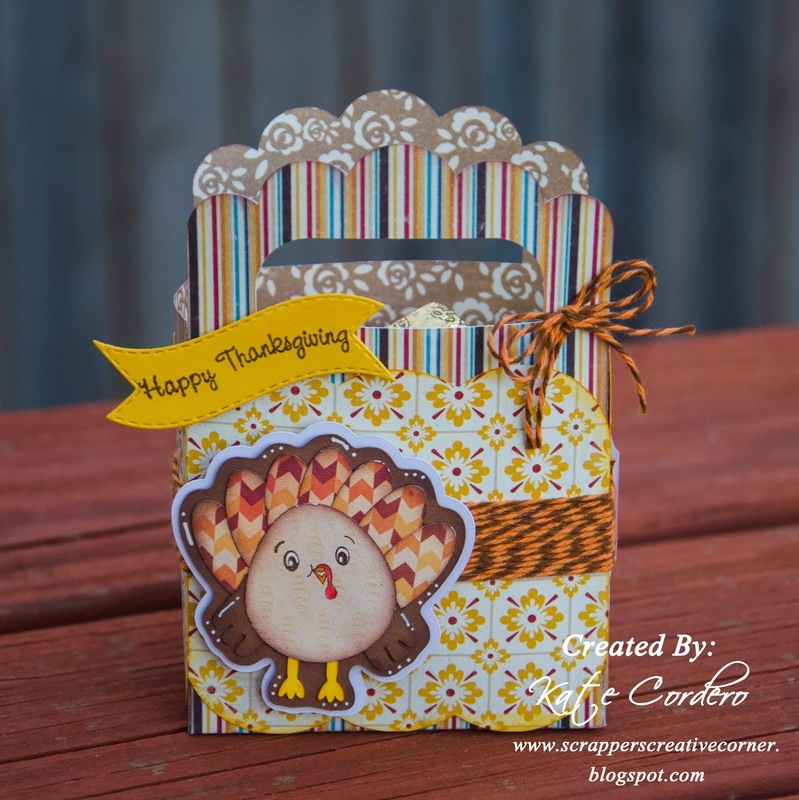 I have a Thanksgiving treat box to share with you today. The cute little scarecrow is from the silhouette store along with the sign. The stamp sentiment is from Jaded Blossom. The Orange Truffle is on sale right now. Also don't forget to check out the Outlet - Clearance section. Here are the new Christmas colors, how gorgeous are they!! with you and then you can hop over the blogs for more information. for taking the time to participate in this birthday celebration. We hope that we have given you some crafty inspiration today. Stop by each blog for more details on each tag. Good Morning Everyone, hope everyone had a Great Weekend. It's Kate here from Kate's Creative Corner and I have a little treat container to share with you today. 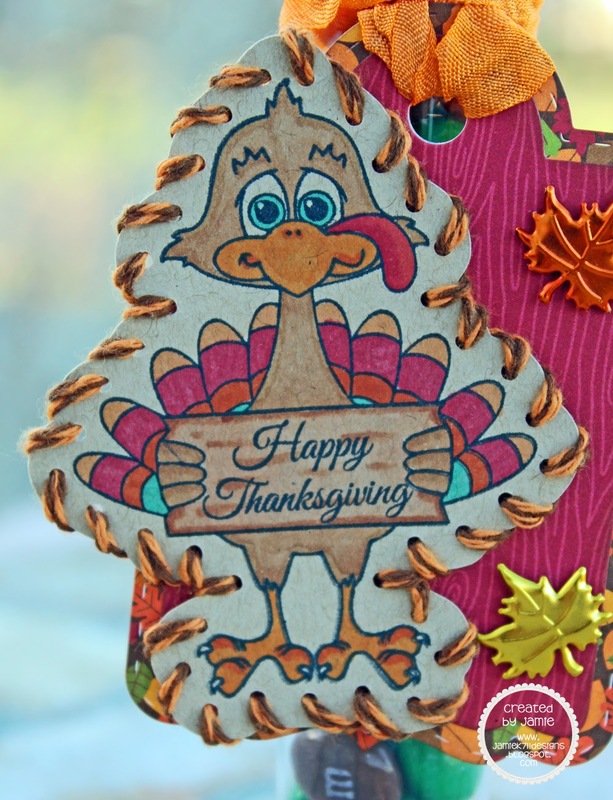 I cut my container bag and Turkey using a cut file from SVG Cutting Files. I then stamped my turkey using the Critter Faces from Peachy Keen. My Sentiment and Tag are from Jaded Blossom. Paper is from Lily Bee Designs. Hi everyone! 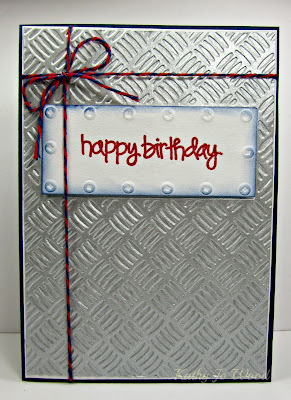 Kasi here from 19Eighty Expressions guest designing for the awesome Trendy Twine! For my guest spot on the blog I dressed up a dollar store frame and made a super cute and super easy piece of home decor. Inside the frame is a piece of burlap cut down to size. I cut out the letters for the word Fall from cardstock and glued it onto the outside of the frame. I also glued buttons on. 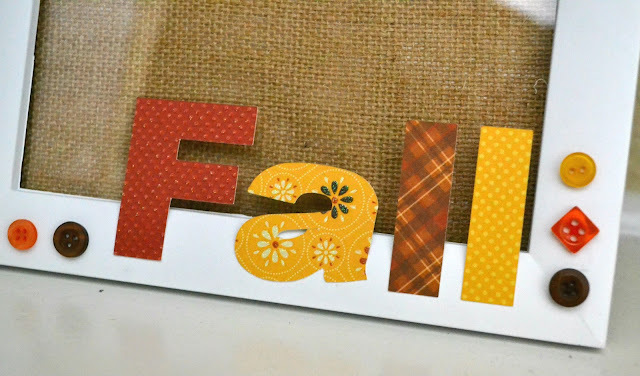 I used a scallop circle punch for the banner. I folded each circle in half and strung them on two layers of Orange Truffle twine. Jessica here from Chick-n-Scrap with a fun card to share. This month the DT is featuring the Orange Truffle twine which is a twist of orange and brown. It is perfect for all of those Fall projects. 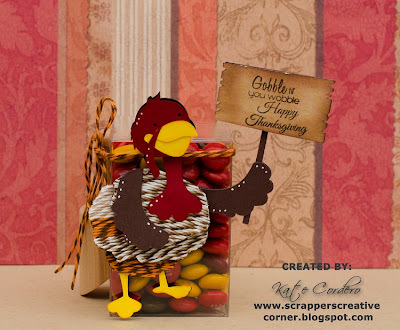 So for my inspiration I made a Thanksgiving Shaker card. If you have yet to try one of these cards out yet, I highly recommend you give it a go....they are so fun and very easy to put together. To make my card, I started out with a file I purchased from the Silhouette Store~An A2 Fall Acorn card by Lori Whitlock. The frame of the card is actually cut out and perfect for threading my Orange Truffle Trendy Twine through. 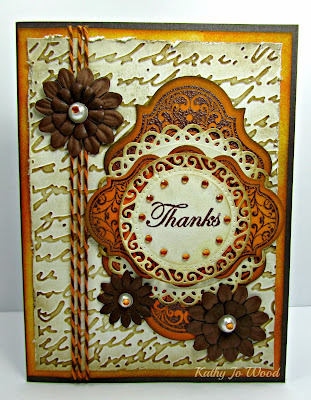 Before moving on I stamped my sentiment~ from My Creative Time- Teeny Tag Holidays stamp set. I added a piece of plastic (recycled stamp package) and then lined the bottom part of the acorn with some foam strips. 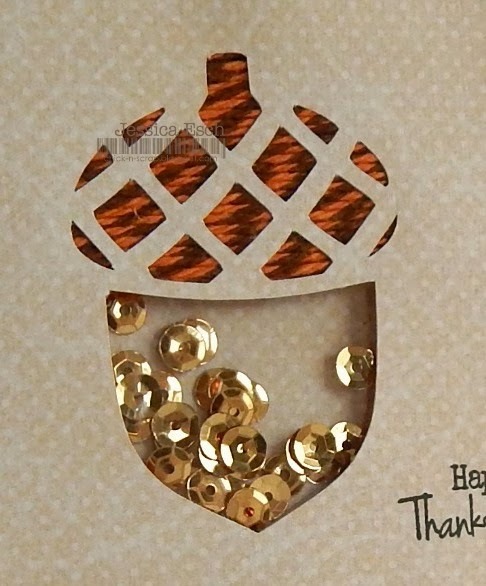 Next I filled the inside of the acorn with my gold sequins and then added a backing of the matching designer paper..that holds everything in place and now you can flip the card over to see the sequins shake inside! My shaker is complete and now the card was ready to put onto my card base. And since I wanted the shaker to be the focal point, my base is a plain brown piece of card stock. I hope you have enjoyed my project and will give this a try! Jamie here to share a new project using Orange Truffle. I added some rhinestone holes to the Jaded Blossom svg outline and cut it with my Cameo. 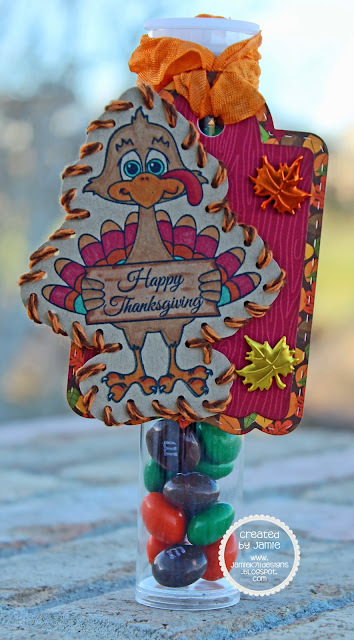 Next I stamped and colored this adorable turkey! Then I took the Orange Truffle Twine and stitched it through the holes. Here's a close up of the turkey with stitching. 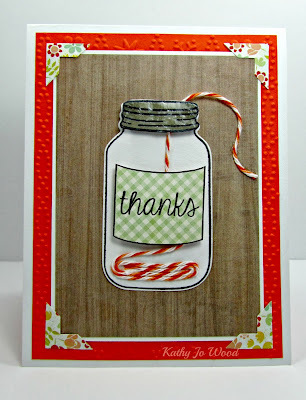 Love this color twine! Stop by my blog to find out all the details on my treat HERE. You can pick up some Orange Truffle HERE. Happy Monday! 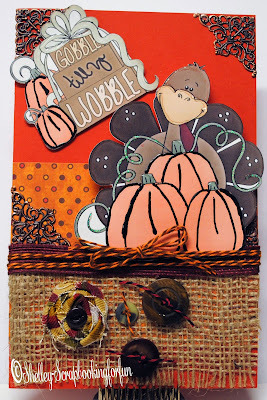 It's Sukie here and I have a fall themed card to share. This month we are featuring the Orange Truffle twine which is a twist of orange and brown and is perfect for all of those Fall projects. I embossed the background of my card with the Paper Lace Cuttlebug embossing folder and inked it for added dimension. 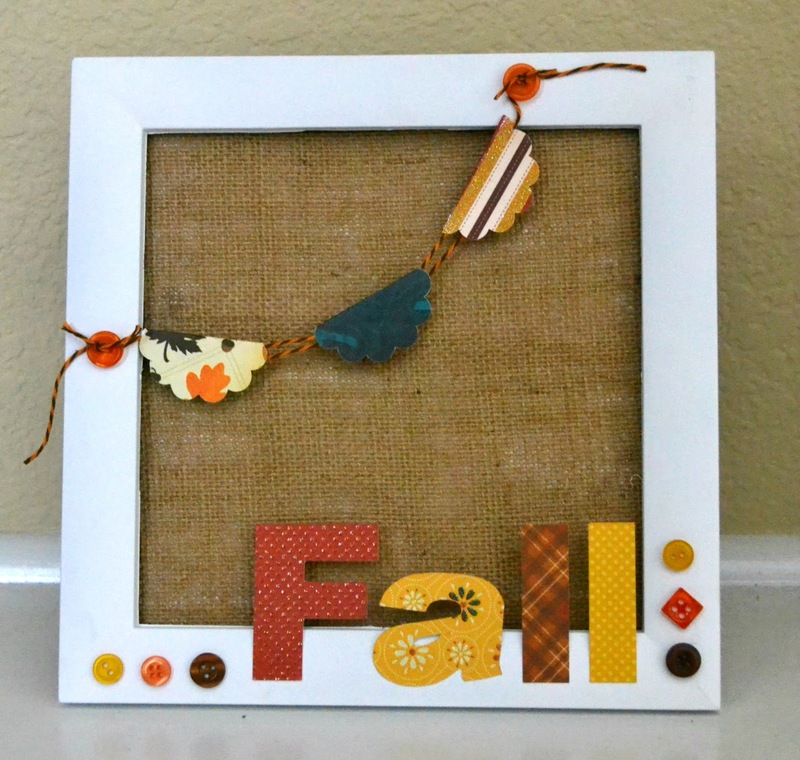 I added a layer of burlap ribbon and card stock wrapped in twine as the focal point. I punched a scalloped circle and adhered a hand cut flag with a sentiment from the Scrappy Moms Mini Messages stamp set. 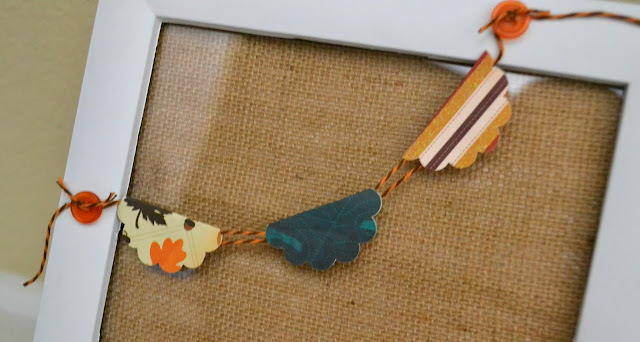 Some paper leaves, stick pins, a coordinating button and some curled twine finished off the card. The Orange Truffle twine is on sale in the store. 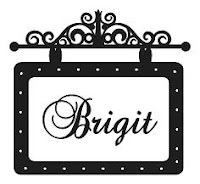 The store is packed with all sorts of goodies, perfect for the upcoming holiday season. Thanks for stopping by and have a great day!